The Alen BreatheSmart Smart Bundle includes on Alen BreatheSmart Air Purifier and two filters. 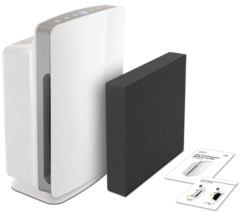 The Alen BreatheSmart® HEPA Air Purifier is the smartest, quietest, and most powerful Alen ever. With 42% greater airflow, 42% more coverage, and 50% quieter operation, the BreatheSmart truly offers a new way to breathe pure air. 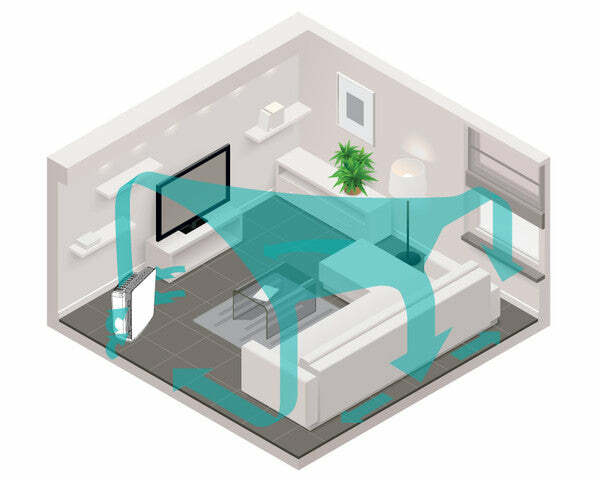 The Alen BreatheSmart's SmartSensor Technology takes the guesswork out of cleaning your air, automatically adjusting airflow to protect you while saving energy and extending filter life. Buy yours today and breathe smarter. Why Buy an Alen BreatheSmart? Of all the air purifiers on the market, and we know virtually all of them, we love this one the most because the folks at Alen created a unit that can change as your needs change. For example, if your main air quality issue is removing germs and pet odors today, when your kids are grown and gone you can simply change the filter type and the same unit will continue to meet your needs in the future. No need to buy a whole new air purifier. No other manufacturer thought that far ahead! With customizable designer panel colors, the BreatheSmart can be personalized to fit any room and compliment your decor for today or whenever your styles change. From turning it on to everyday use, the BreatheSmart air purifier was designed to be easy and intuitive. Set to Auto, the BreatheSmart adjusts fan speed automatically when it detects changes in air quality caused by pet movement, windows opening, the A/C turning on, or other factors. Long lasting filters are a breeze to change with a simple 3-step process. A selection of front panels with different colors and textures lets your BreatheSmart work beautifully with the look and feel of your space. Inside the air purifier, Whisper Max design features ensure quiet operation at any speed. Whether next to a crib or in your living room by a sofa, the BreatheSmart series fits in beautifully. This beauty has got brains. The BreatheSmart series is packed with intelligent technology that maximizes performance and comfort in an elegant, compact form. The BreatheSmart comes with the HEPA-Pure Filter, making it the perfect choice for those with persistent asthma and allergy concerns. If you have more specific concerns, Alen has other filter options including: HEPA-Silver (Allergens, Light Odor, Mold and Bacteria), HEPA-FreshPlus (Allergens, Chemicals and VOCs), HEPA-OdorCell (Allergens, Smoke and Heavy Odor) Filters. Using WhisperMax Technology, air is drawn into a uniquely designed fan and air chamber. Working together, the BreatheSmart can purify large amounts of air while maintaining a peaceful environment. Once inside, the air moves through advanced HEPA style material where allergens and pollutants are captured. Finally, purified air is then circulated back into the room. After conducting air quality studies, our Air Purifiers America experts have found the air quality in a room can returned to pre-cleaned levels only two hours after turning off an air purifier. Based on these findings, we recommend you run your air purifier 24/7 to maintain the cleanest air possible. If you run your air purifier at the recommended levels, you air purifier will require a new filter every 8-9 months. Power Conversion: Do not connect this unit to a voltage converter or plug adapter. Doing so will void the warranty. Room Coverage: 1100 Sq. Ft.
All Alen HEPA air purifiers come with a Forever Guarantee. We come to work every day for one reason - to make high quality air purifiers and filters so you can breathe better, feel better and live better. That’s why we created the air purifier industry's first and only Forever Guarantee. We’re in this for life - your life. If you've used your Alen air purifier for personal purposes in the United States and it quits operating under normal conditions, we guarantee to provide you the same or comparable refurbished purifier with free shipping." Orders placed by 3 PM EST ship the same business day.